A nice book for talking about reusing or salvaging materials! This book is nominated for the 2018 Blue Spruce Award from the Ontario Library Association. I read a copy from my local library. When an ice storm snaps a small girl's favorite branch from the tree in her yard, she's crestfallen. The girl's mom says it's just a branch. But not to her! "That was the branch I sat on, jumped from, played under. It was my castle, my spy base, my ship . . ." Luckily, her neighbor Mr. Frank understands. He says the branch has "potential." "What's potential?" she asks. "It means it's worth keeping." And so, with imagination and spirit, and Mr. Frank's guidance and tools, the girl transforms the broken branch into something whole and new, giving it another purpose, and her another place to treasure. 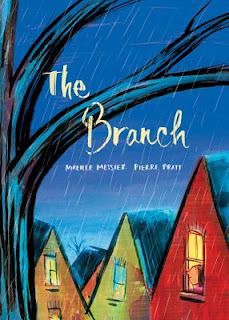 The Branch was written by Mireille Messier and illustrated by Pierre Pratt. It was published by Kids Can Press in 2016. It’s past my bedtime, but I can’t sleep. I really liked how the effects of the ice storm in this story were made so personal for the main character. There were also lots of sensory details: the sound of icy rain hitting my window and the splintery part on the trunk. The ending was a lovely surprise and very fitting. Unlike many recent picture books, this one is on the longer side at 774 words. This book offers many possibilities for discussion – weather and storms, losing something you care about, fear, imagination, reusing materials and community. Imagine: If you climbed into a tree with a perfect branch, what would you imagine? Draw a picture. Create: Go on a hunt outside and find your own branch. Use paint, glue, yarn or whatever you can find to turn your branch into something special. A teaching guide with more resources is available on the Kids Can Press website. Sweet. It is important to recognize the value something can have for a child that we might not see: "it's just a....." Great choice. I remember making a treasure of a branch from a favorite tree I lost in my back yard after a storm when I was a child. I have a feeling I will more than love and relate to this story. Thank you for sharing this book today. This is a great find. I haven't seen it yet. I look forward to finding it. Having lost a number of "beloved" branches (the top leader of one tree) and a few trees this winter, I can definitely relate to the MC. This is a treasure. Can't wait to read it. It has so many applications. Enjoyed your activities. oooh - I love the idea of finding a branch to decorate! Sounds like an interesting book to read.